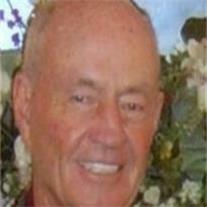 Robert A. Johnson, 76, of Gilbert, AZ died peacefully at home Monday. Born in Brockton, MA to Arthur and Ruth Johnson; he was Vice President at Brockton Hospital and President of the Goddard Hospital Stoughton, MA. An avid golfer and reader, whose humor and kindness were recognized by all; he joins his son Scott who died in 2008, and is survived by his wife Gayle Maroon Johnson, daughter Cheryl Spear, son Kevin, brothers, Arthur, Ernest, and Larry, grandchildren Douglas and Donald Spear, Samantha and Jamie Johnson, and countless friends. Celebrations of Bob’s life are being planned for the near future in both AZ and MA. The family asks that in lieu of flowers, donations be made to the ALS Association.